Welcome to our SCAM MARINE website. We would like to introduce our company to you and show you that we can be an attractive partner for you. We are dedicated to remain the leading Croatian company in manufacturing and exporting of marine engines, marine generators, high quality boat equipment with optimal prices for domestic and export markets. This mission is being achieved starting by our own development of innovative products, our own production of these products, distribution of products and all that supported by our professional service department. This whole chain creates the basis for a loyal and satisfied group of customers worldwide. • We are a family-owned company with a long tradition in manufacturing which started in 1985, resulting in already three generations of continuous growth and development. • Innovation and our continuous investment in development are the basis of our success. • Today’s market situation demands a short time span from idea to development and implementation of projects and this is our strength. • Encouraging and rewarding diligent and responsible work, with continuous learning and improvement of all company employees. • Development of long-term partnerships with key suppliers to achieve success together. SCAM MARINE: reliable partner, reliable product! SCAM MARINE was established in 1985. as a workshop, manufacturing hydraulic steering equipment and repairing and reconditioning marine engines. 1990- Developed a complete range of hydraulic steering equipment for boats up to 30 mtr. 1991- Started with marinisation of Kubota industrial engines. 1995- Obtained a license to sell and service IVECO marine and industrial engines. 1999- Received certification from TÜV for the production of stainless steel flanges. 2002- Certified by CRS (Croatian Register of Shipping) for marine diesel engines maintenance and repair. 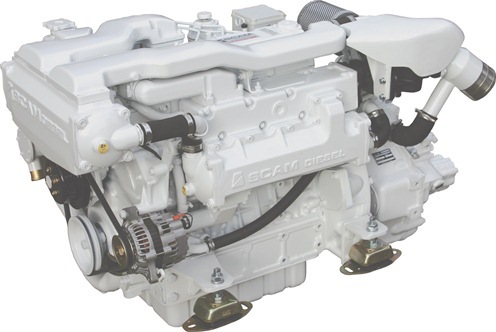 2003- Start of serial production of SCAM DIESEL marine engines based on Kubota industrial engines. 2004- Scam Marine became official representative of MITSHUBISHI marine engines. 2005- Official representation for TWIN DISC marine transmission obtained. 2008- The company was certified according to ISO 9001 by the Croatian Register of Shipping and Bureau Veritas. 2009- CE certification for hydraulic steering gears from the "International Marine Certification Institute" obtained. 2009- We became the exclusive distributor for PYTHON-DRIVE products. 2010- Adopted the production of new models marine engines. 2011- The company moved to our current new location with a total area of 13,000 m2, of which 5,000 m2 covered area. 2012- We finished the building of our nonferrous metal foundry and put it into use and adopted technology for casting aluminium alloys, brought in new staff and educated personnel. 2013- New factory facilities and new technologies have helped the development of new products for the fishing industry in several Scandinavian countries. 2014- Development of a new range of products used for the Oil Offshore industry, such as winches and other products. - Restructuring of production methods and increasing our production capacity. continuous education of the existing workforce.